Your child can be a banker for a day! Kids Banking allows your student to experience & participate in the day-to-day activities of a bank. The free 3-hour program is open to students entering the sixth grade, and your student will receive a “paycheck” for working that can be cashed or deposited into a new or existing account. Students also get a HOMEBANK nameplate, t-shirt, and refreshments during the day they work. Kids Banking will be offered from 8-11 a.m. in our Canton branch June 10-14; in our Hannibal and Quincy branches (12th and Broadway) June 17-21; in our Centralia and Quincy branches (305 N 48th Street) June 24-28 and in Palmyra July 15-19 and July 22-26. Students are to attend one session during the week. To sign up your student, REGISTER ONLINE, stop by your local HOMEBANK location or call us at toll free (855)577-2001 two weeks in advance. Joni Bock has been promoted to Senior Vice President – Commercial Underwriter. This role transitions her from dealing directly with customers to a more supportive role to the lending department. Megan Crawford has been promoted to Lending Assistant for Commercial and Ag loans in the Quincy market. Her new responsibilities include ordering appraisals, title work, evaluations, and renewals. Kallie Dixon has been promoted to Vice President and adds CRA (Community Reinvestment Act) Officer to her list of duties. In her new position, she will be managing and monitoring the progress of the Bank’s CRA program, which includes identifying Community Development opportunities. Larraleigh Hetzler has been promoted to Loan Officer. In this position, she will assist customers in Northeast Missouri in the agriculture, commercial and home loan process. Melissa Meyer has been promoted to Vice President of Loan Servicing. Melissa started with the Bank part-time in Bookkeeping, has served as teller, and has worked in information technology and audit before transitioning to loans. Reann Redd was recently named Lending Assistant and promoted Assistant Vice President. She started with the Bank in 2012. Her new duties include those of a lending assistant along with supervising the processing department. Vaness Rupp has been named Senior Vice President–Mortgage Underwriter and takes on a supervisory role for the Mortgage Processing Department. Rupp was recently recognized for 15 years of service. HOMEBANK and its employees have donated $10,575 to the Buddy Pack, PAWS Packs and KidzPack programs in Missouri and Illinois to help provide food for children who may go hungry over weekends and breaks when they are not in school. Employees made contributions from July to December 2018 to participate in jeans days, lunches and other special events. Earlier in 2018, as the result of a similar employee Fundraising program, the bank donated $10,000 to the Wounded Warriors program. HOMEBANK is pleased to announce the addition of three team members to its branch at 1399 East Highway 22 in Centralia. Taylor Warbritton of Centralia has been hired as Loan Officer. In this position, she will assist customers in applying for and acquiring loans for home mortgages, vehicles, and other personal needs. A graduate of Paris High School, Warbritton earned a bachelor’s degree in business management from Hannibal LaGrange University and worked in the banking industry for seven years prior to joining HOMEBANK. She is active in the Centralia Rotary Club, Friendship Christian Church and volunteers with the Future Business Leaders of America (FBLA). Nicole Wilt of Paris has been hired as a Customer Service Representative for HOMEBANK. In this position, she will be responsible for opening accounts, facilitating customer deposits and withdrawals and general customer service. A graduate of Paris High School, Wilt attended Moberly Area Community College and earned a general education degree with a minor in social work from Central Methodist University. She has seven years banking experience and is active in Monroe City Cancer Supporters. Dollens of Centralia, a sophomore at Centralia High School, has been hired as a part-time Customer Service Representative. Dollens is a member of the high school volleyball team, SCRUBS science club, Student Council, FFA and Key Club. HOMEBANK, its employees and friends recently donated more than $10,000 to the Wounded Warriors organization. Retired US Army Sergeant, Wounded Warrior and Volunteer Angie Peacock from St. Charles, MO, center, accepted a check from HOMEBANK management on Wednesday, Oct. 3. Pictured left to right: HOMEBANK Central Missouri Market Community Bank President Tom Nelson, HOMEBANK Illinois Market Community Bank President Mark Hayes; HOMEBANK Northeast Missouri Market Community Bank President Josh Wilson, Angie Peacock from Wounded Warriors, HOMEBANK CEO Joe Thomas, and Committee Members Curt Meany and Kallie Dixon. In an effort to encourage math skills and an understanding of money at an early age, HOMEBANK has installed a Discovery Bar for children at its Palmyra and Quincy locations. Age-appropriate games from Good Neighbor Press, Inc., have been installed on two electronic tablets in the bank’s lobbies. The games have been selected to teach children about counting, recognition of numbers, addition, the value of coins and more. The new Discovery Bar also entertains children while adults take care of their banking needs. Nearly 450 second-grade students in Palmyra, Hannibal, Philadelphia and Canton, MO, learned about the importance of saving money during presentations given by HOMEBANK employees April 23-27. For more than a decade, HOMEBANK has offered “Teach Children to Save,” a 30-minute program featuring discussions about saving, counting money and making sample deposits, and learning about interest. Hunter Baggett of Palmyra has been hired as Business Banking Associate for the Hannibal HOMEBANK resource center. In this position, he will set up commercial customers with HOMEBANK business banking products, such as cash management and remote deposit capture, and will train customers on the use of these products. A graduate of Palmyra High School in 2014, Baggett earned a bachelor’s degree in business administration from Culver-Stockton College. Prior to joining the bank, he worked for Farmers Insurance as an agent in Palmyra. Amber Miles of Palmyra has been hired as a full-time Customer Service Representative for HOMEBANK’s West Quincy facility. In this position, she will be responsible for opening accounts, facilitating customer deposits and withdrawals and general customer service. A Leonard, MO native, Miles earned an associate degree in business management from State Fair Community College and is currently pursing a bachelor’s degree from Central Methodist University. She attends Leonard Christian Church and The First Christian Church of Palmyra. Lane Brandon of Hannibal has been hired as Bookkeeping/Digital Banking Representative for the Palmyra HOMEBANK resource center. A Quincy, IL native, Brandon brings banking, customer service and management experience to his position. He earned an associate degree in accounting from John Wood Community College and is currently pursuing a bachelor’s degree from Independence University. Olivia Sublette and Mason Mitchell, both juniors at Palmyra High School have been hired as part-time Customer Service Representatives. Sublette will work in HOMEBANK’s Palmyra resource center and Mitchell will work in the resource center at West Quincy. Three HOMEBANK employees were recently recognized for their years of service. Cyndee Lester has been employed by HOMEBANK for 10 years, and Melissa Meyer and Vaness Rupp have been with us for 15 years. Congratulations! HOMEBANK has donated $500 to The Food Bank of Central and Northeast Missouri. We’re told that this donation will allow them to purchase $10,500 worth of food for hungry folks in Hannibal. 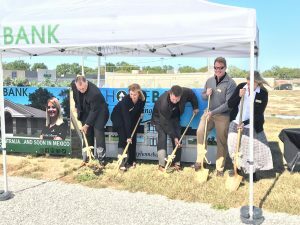 HOMEBANK officials broke ground Oct. 16 for construction of a new HOMEBANK Resource Center in Mexico, MO. The full-service banking facility will open in 2019. Pictured left to right: Joe Thomas, CEO and Chairman of the Board; Mary Dickey, Senior Vice President; Tom Nelson, Community Bank President for HOMEBANK’s Mid-Missouri Market; Byron Webb and Victoria Sack, Directors. HOMEBANK recently donated $500 toward the purchase of necessary computer equipment and software upgrades for classes in the Business/Technology Department of Marion County R-II Schools. In an effort to keep student learning and curriculum up-to-date, the school is adding Google, Junior High Coding and Robotics, and Multimedia courses to its fall lineup and is updating its Accounting, Graphic Design/Desktop Publishing and Computer Applications courses. Technology Coordinator Lisa Arment, Multimedia Specialist Lori Shuck, and Business Instructor Wendy Plunkett are spearheading the fundraising effort. Picture Cutline: (l-r) Marion County R-II Schools Technology Coordinator Lisa Arment and Business Instructor Wendy Plunkett accept a $500 check from HOMEBANK Community Bank President Josh Wilson for technology course upgrades for the fall.